Ok, who’s tackled most of their library’s summer reading list of books? Not us. But, we are reading as much as we can between therapies, vacations, and summer fun. I use the iPad to introduce new interactive reading apps to my son. He loves Dr. Seuss and we’ve been using a couple of Oceanhouse Media, Inc.’s apps, The Butter Battle Book and Dr. Seuss’ Short Stories. It’s becoming easier to tackle our summer book list with the iPad because it goes with us everywhere now. The Dr. Seuss Short Stories app includes about 8 different stories. My son can listen to the story or read it himself. He can also tap words and pictures to see the word pop up and hear it said. This really helps him recognize it the next time. Other apps we use are ones children can create their own stories with My Stories app. Kids love to see themselves in books and hear their own voices. Another app Lazy Larry Lizard, free, is an interactive book for beginning readers where kiddos get to help Larry through his adventure. They can poke him to wake him up. Storia is Scholastic’s app kind of like a Kindle for kids. You can download all sorts of ebooks from Clifford the Big Red Dog to Harry Potter for kids of all ages. When you first sign up, you automatically get five free ebooks. You can search on Scholastic’s web site for age-appropriate books. It’s pretty nifty. After writing this, we vow to complete one book a week (or day, depending on length). 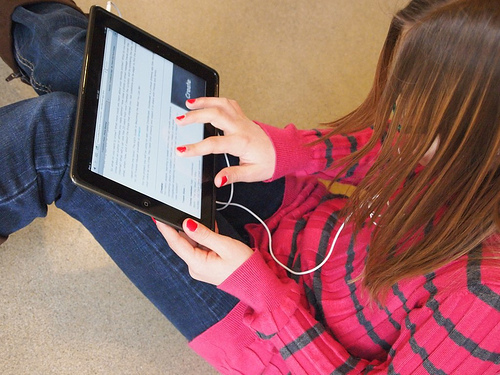 Hopefully, these apps will help you tackle that summer reading list with confidence, too!